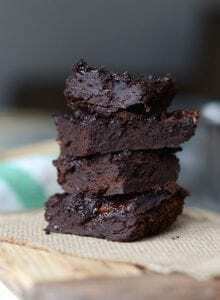 Flourless Protein Brownies - Just 5 Ingredients, Vegan + So Fudgy! One of my favourite, quick treats is two-ingredient “magic” brownies. They’re made by simply mixing very ripe bananas with cocoa powder. I don’t know how they work but somehow they bake up into amazingly decadent, healthy goodness, hence the “magic” factor. 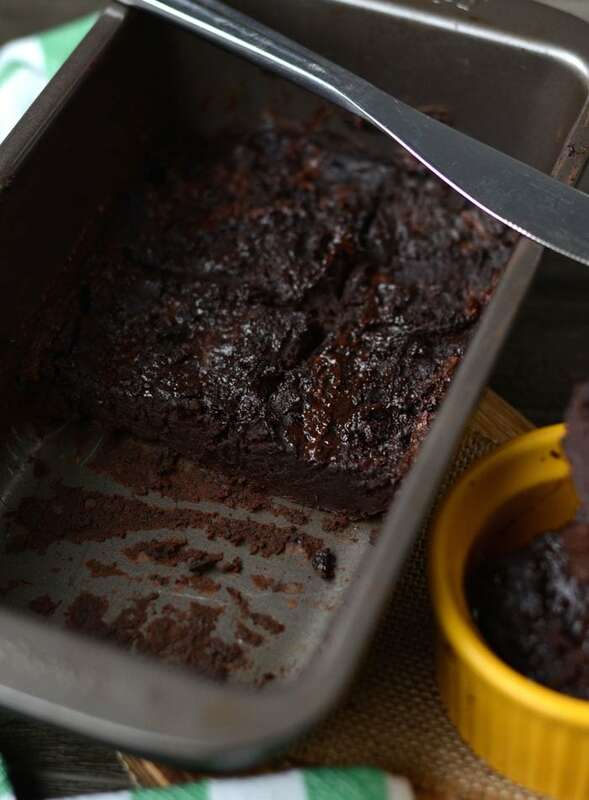 These flourless protein brownies are an upgraded, extra rich and fudgy version that favourite. I’m kind of obsessed…they’re right behind me in the fridge at this very moment…just sittin’ there, being all delicious and stuff…k, I’m going to get another one! But NBD, one brownie comes in at just 82 calories with 13 grams of carbs, 2 grams of fat and 5 grams of plant-based protein. So have one, or two..or three. 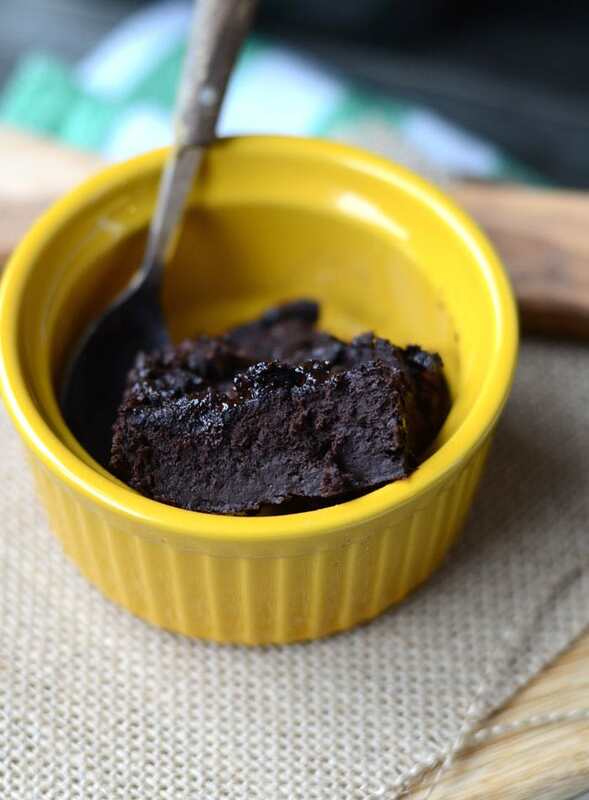 Build A Better Flourless Protein Brownie! The unsweetened applesauce keeps them nice and moist with the addition of the protein powder as a second dry ingredient. You only need 5 ingredients in total to make these and they less than 5 minutes to prep. The only hard part is waiting for them to bake and cool. The result of the extra ingredients? 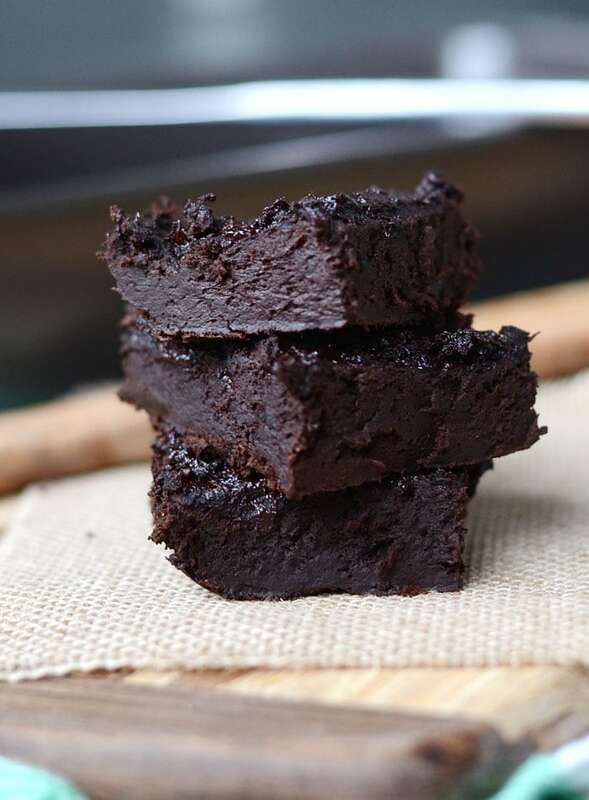 Ooey, gooey, fudgy, rich, healthy flourless protein brownies you can eat for dessert, or for breakfast, or for a snack. Vegan, gluten-free, oil-free and as far as brownies go, very low in carbs and sugar, plus they’re low in fat (2 grams!) with 5 grams of protein per brownie. 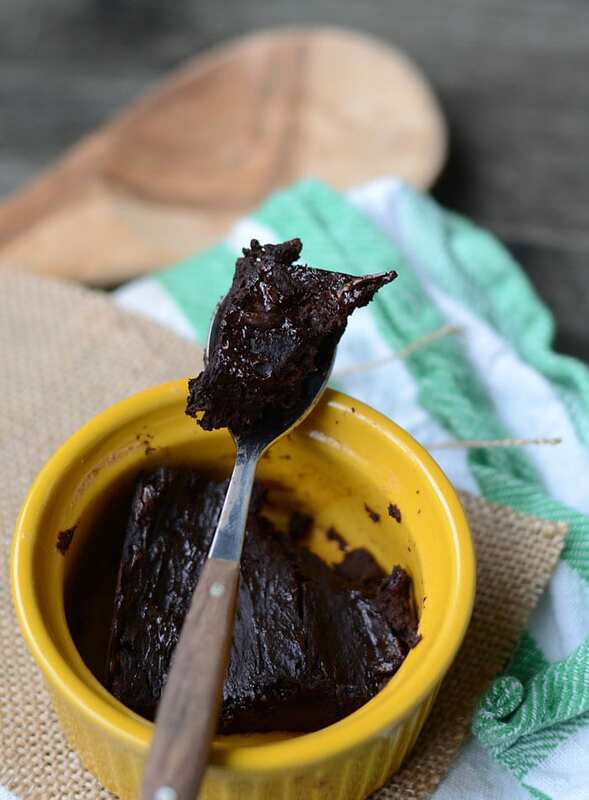 These easy to make brownies come in at just 82 calories each plus they’re low in fat and made with just 5 simple, wholesome ingredients for a healthy and guilt-free indulgent treat! Place the bananas, applesauce, cocoa powder and protein powder in a food processor and mix until completely smooth. Prepare a loaf pan with non-stick cooking spray then spoon in the batter from the food processor. It will be very thick so this takes a bit of work. Use a spoon to spread it out so it’s flat and even. Evenly distribute the chocolate chips on top. Place them in the oven. After a few minutes, remove and use the back of a spoon to spread the melted chocolate chips. Place back in the oven. Bake for 20 minutes. They’ll seem under done when you take them out but once they cool, they’ll be good to go. Let cool in the pan then slice into 8 squares. You can store these at room temperature or in the fridge. I like storing in the fridge because they get extra fudgy and delicious that way! It’s not imperative that you use extra ripe bananas, as long as they’re not under ripe it will work fine. 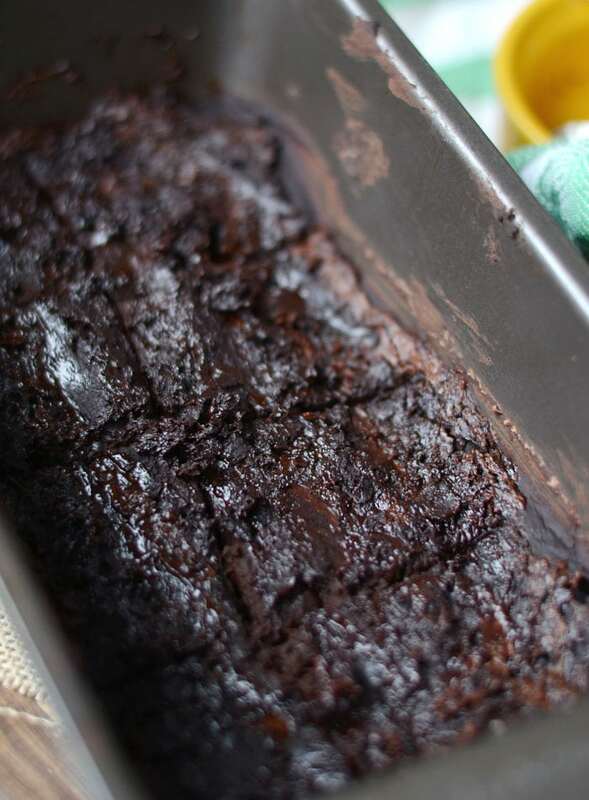 Very ripe bananas will result in richer, sweeter brownie but the recipe will work either way. You can either stir in the chocolate chips and bake as is. Or add them on top, then spread them around once they melt. I like spreading them so they’re evenly distributed overtop of each piece. I think you should be able to replace the applesauce with extra banana or even pumpkin puree but I haven’t tested it, so I can’t guarantee the same result. These b rownies realy look good. I wonder if I could add walnuts, since I always have walnuts with my brownies. Sure, you can add walnuts! The added benefit of walnuts (or any nuts or seeds) is that they will raise the protein content as well. I love how easy this recipe is! The brownies just look so soft, gooey and rich when cut up! I tried this with whey and it worked fine ? I also made a single serve and micro waved it for ~60s and that worked too! Delicious! Thank you so much for your feedback, Grace! So glad you enjoyed them and it worked out with whey protein. 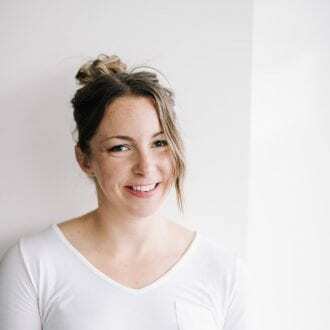 Grace – did you make just a single serve mix? Or make the whole mix and then just used 1/8 in a mug? Just made these last night!! They were SO delicious. They are definitely going to be a staple for when I’m craving something sweet. Thanks for sharing! Made these with casein protein powder and they turned out delicious! Awesome! Thanks so much for your comment. These look fantastic Deryn!! 🙂 What brand of protein powder do you recommend?? Hey there 🙂 I used Vega Performance Protein in Vanilla flavour! I’m not a big fan of protein powders in general but this recipe looks yummy! Could I replace it with cocoa powder? I think it would work but I can’t guarantee results! Also, the flavoured protein powder adds sweetness so you might have to add some more sweetener! Let me know if you try it! I dont have any protein powder and unfortunately i dont have the money 🙁 can I sub it with anything else? I haven’t tested it with anything else yet but some people have used more cocoa powder or powdered peanut butter to replace the protein. I can’t guarantee results without it though. If you do use cocoa powder, I’d recommend adding another sweetened because it might come out bitter if not! Wow! These are so easy and look so fudgey and delicious! 1. What if I don’t have applesauce? I don’t know where I’d find it where I live, and I don’t want to make it myself. An extra banana and/or some oil, perhaps? 2. You mentioned two-ingredient brownies at the beginning but I can’t find a recipe for that online. How would I make those? I know these will be less healthy but I’m not too concerned about that. I just want a tasty, convenient treat sometimes while still being vegan. How big is a scoop of protein powder? could you please give standard equivalent in Tablespoons? I’m not sure in tablespoons, I’d have to go measure it out. I did include the weight though: 41 grams. If you have a digital food scale that would be the best way to get an accurate measurement. I think it’s around 1/3-1/2 cup but it depends on type of protein you use as some are more light and fluffy than others. My protein powder scoop is 30g. Do you think I should use this amount or weigh out 41g? Can’t wait to try the recipe! Nice recipe but you have not given the tray dimensions. I have a feeling this is a smaller baking tray than one I would normally bake with so sizes of the tray would be really useful! I used a loaf pan, I will add that to the recipe. Thanks. I didn’t have a loaf tin, so I used a cupcake tin. Put two scoops of the batter into each hole (six hole tin). They cooked faster, finished at ten minutes and popped right out! The protein powder didn’t affect the batter at all and they’re delicious! Great recipe, thank you. Made these yesterday. Used a composite protein powder (whey and casein). They tasted amazing, and did not last long! I am the worst baker, but these were completely fool proof. I used slightly frozen bananas. After 25 minutes it was cooked at the corners but the middle was like a smoothie. Put it back in for another 15 minutes. Slightly frozen bananas would change the cooking time for sure. Fresh, ripe bananas are best. Did you measure out all the ingredients exactly as I’ve listed in the recipe? I’ve made them numerous times and they’ve worked out great! Sorry you didn’t have the best results. Made these and used a mocha flavoured plant based protein! They were delicious 🙂 Been looking for low cal vegan treats and this was perfect! Oooh, ya. They’d be aweosme with mocha protein! I’m assuming the 2grams of fat are from the chocolate chips because my protein powder is fat free. That being said I’m going to make them minus the chips so they’ll be fat free. Yes, definitely! If you want to reduce the fat, omit the chocolate chips. Any suggestions for substituting the banana? I don’t like the banana-chocolate combination not to mention that banana, like gluten, raises my blood sugar – not a good idea with type 2 diabetes. You could try with pureed pumpkin or sweet potato but I can’t guarantee the recipe will come out the same. Good luck! I don”t consider protein powder healthy and it gives me migraines so I avoid it but the 2 ingredient brownies you mentioned sound good. I looked through your recipes but didn’t find it. Could you give us more information on that one, please? I have the same problem with protein powders because of the fake sugar. But On Gold Standard Natural works well for me because there is real sugar and natural ingredients. I’m allergic to bananas, what would be a substitute for them? You could try pumpkin or sweet potato but I haven’t tried the recipe with either of those so I can’t guarantee it will work out the same! So i just made these and they came out light brown and spongy?? Any ideas what I did wrong? Hmm, I’m not sure without knowing exactly what you added. Did you follow the recipe exactly? I made these tonight. I used a mint chocolate chip whey protein and I added a tsp of mint extract. They turned out awesome! The texture was a bit spongy and to me it tasted a bit like dark chocolate banana bread. Mint Chocolate Protein Brownies ftw!! Hey Jen! Great idea to add mint, sounds delicious. Ya, the texture isn’t quite a typical brownie since there’s no oil or anything but they’re perfect for a healthier treat 🙂 Thanks for your comment! Would you happen to know the protein/carb/fat amount for the entire recipe? Can’t wait to make these! From what I had entered in MFP, it’s 102C/21F/41P but I would double check that by entering it on your end! Well I have tried this recipe twice and bad results both times. They just don’t seem to bake they never harden and they taste bad won’t try these again. I’m sorry they didn’t work out for you, Ruben! I’ve made them numerous times with success as have many readers so I can’t really offer much advice as to why they didn’t work out. If the recipe is followed exactly they bake up nicely and taste great. Sorry again! Im with this guy. They taste like fruit. The texture is off. Other than the look they are nothing like brownies. I’m sorry you didn’t like them. I don’t find they taste like fruit at all and I’ve made them many times. Did you follow the recipe and measurements exactly? They’re definitely not a traditional brownie, without butter, eggs, sugar or oil you can only get so far! Anyhow, sorry they didn’t turn out for you. Thanks for the feedback. Awesome! So happy they turned out for you. I’m sure it could work as mug cake! I haven’t tried it but that’s a great idea. Let me know if you try it! Hi, I don’t have any chocolate or vanilla protein powder, only strawberry so would I be able to use that? Ya, that should work! They’ll just have a different flavour. Good base but even with very ripe bananas they were not sweet enough so I added liquid sweetener and I think that prevented them from setting. This recipe didn’t not work for my tastes. Absolutely loved these!! I didn’t have any apple sauce so I kinda eyeballed it and used almond butter instead. I used chocolate flavoured soy protein powder and this was fabulous. I scooped them into silicone muffin liners and baked for 20 mins at 180C. So so so yummy! Awesome. So happy to hear that, Vickie! Thanks for leaving some feedback for the changes you made! Hi. If i want more protein, can i add additional scoop of whey? How do i adjust the other ingredients? Thank you! You could try adding additional banana and/or applesauce but I’m not exactly sure how much, it’s hard to say without testing it so I can’t guarantee results. Let me know if you try it. Thanks! I made this with the mocha flavored Vega and the coffee flavor was pretty nice! Do these freeze well? I made them and omg they are amazing!! No one would know they are the least bit healthy, I added a tad baking soda and an egg white. Hi Sydni, I’m sorry I’ve never froze them so I can’t say! I think they’d probably be okay though. Glad you enjoyed them! These are gross. Followed the recipe exactly. They have a weird consistency and way too much cacoa powder. Sorry they didn’t work out for you, Lucy. There a very popular and much loved recipe so I’m not sure what went wrong if you followed the recipe exactly. Thanks for letting me know. Excited to try these! Do you think a Kitchen Aid mixer would work in place of the food processor? Just made these using whey protein powder and they are amazing! So fudgy and rich. Definitely going to become a regular treat for me. Glad you liked them, Jasmin! I used chocolate protein powder and followed the rest of the recipe to a T. Sprayed mini-muffin tins with baking spray, put in batter and topped with mini-chocolate chips and baked for 15 minutes. It was super easy to pop them out of the tins! So, the first bite was okay, but next bite I turned it over so the chocolate chips hit my tongue first and it made a huge difference. I’ll definitely make these again. Thanks for sharing!! Yum!! So glad you enjoyed them! Thanks for the review!